The Jeep Scrambler is a limited edition classic! There were only 27,792 produced from 1981 to 1986. 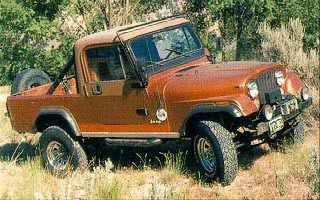 AMC built the CJ-8, a 103-inch-wheelbase pickup with lots of rear overhang as an upgrade to the CJ-6. The CJ-8 came in hard- or soft-top models. The Scrambler was a very modest seller, but an upswing in popularity in the 1990's has turned the old CJ-8 into a very hot item with lots of room for trick modifications. From the windshield forward, the Scrambler is all Jeep in appearance. In soft top form it is America's only roadster pickup. In most of its essential mechanical components, the Scrambler is a twin to both the CJ-5 and CJ-7. The standard engine was the Pontiac-built 82 horsepower 4 cylinder 151 cubic inch engine, optional engine was the 110 horsepower in-line 6 cylinder 258 engine. The AMC 304 and 360 were not given as a factory option. 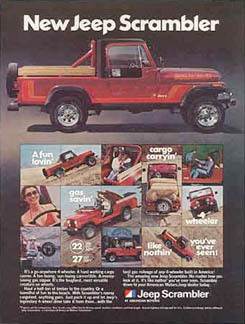 The CJ-8 had a $7288 price tag in 1981, $7922 with HT and options. In 1983 it went up to $7563/$8392. The last 2 years of production saw price drops as each successive year, fewer Scramblers were produced. Wheelbase: 103.5 in. Overall Length: 177.3 in. Front/Rear Tread: 51.5 in./50.0 in. Overall Height: 67.6 in. (Hardtop: 70.5 in.) Width: 68.6 in. Front/Rear overhang: 23.5 in./50.3 in. Tailgate width and height: 34.5 in. x 16.4 in. Ground Clearance: 6.9 in. Load Space (cargo) 61.5 in. x 55.8 in. x 16.4 in. (30.4 cu.ft.) Fuel Tank: 15 gallon (optional 20 gallon). Click Here to see more Scramblers! Scrambler Sites on the Web . . .